The On Top of the World (Central) Owner’s Association oversees twelve (12) neighborhoods within the On Top of the World Community. 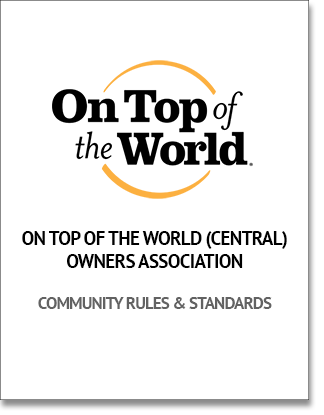 Click on the image to the right to view and download the On Top of the World (Central) Owner’s Association Amended and Restated Rules. The Amended and Restated Rules was presented and approved at the February 13, 2019 Board of Directors Meeting. Recorded Amended, Restated and Consolidated Declaration now available. Please print a copy and place in your DOC book. You may also request a copy by sending an email to the associationinfo@otowfl.net, or pick up in Customer Service. Click the buttons to the right to download a copy of important On Top of the World (Central) Owner’s Association insurance requirements and forms. Click here for Insurance Responsibility of Owners. The Audit Report for fiscal year ending February 28, 2017 is now available. If you would like to review a copy of the audit report, please send an email to associationinfo@otowfl.net or write to the On Top of the World Central Owners Association, Attn: Secretary, 8445 SW 80th Street, Ocala, FL 34481. Attached is a copy of the annual financial report.